Mushrooms are used the world over to add flavor, body, and flare to your favorite foods. Sliced mushrooms make a wonderful addition to pizzas, pastas, casseroles and more. Freeze dried mushrooms are a great way to add some variety to your food storage program. With a shelf life of 10 to 15 years, Honeyville's Freeze Dried Mushrooms are fresh and ready for use in case of emergency, or if you simply forgot to pick some up at the market. Each large #10 can contains 4 ounces of Freeze Dried Mushrooms. Instructions: Add 3 Tablespoons of freeze dried mushroom slices to 1/3 cup of warm water. Let sit for 5 minutes. Drain excess liquid. Enjoy in your favorite dish. Yields 3 Tablespoons of mushroom slices. 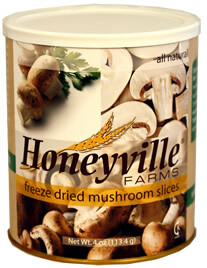 Shelf Life: Honeyville's Freeze Dried Mushroom Slices will store for 10 to 15 years in the sealed #10 can (with enclosed oxygen absorber) under ideal storage conditions (a cool, dry place). Editor's Note: For pasta or spaghetti sauce, simply add freeze dried mushrooms to sauce without rehydrating. Mushrooms will absorb the liquid in the sauce and provide great flavor. Enjoy!